"Working Together for a Stable and Prosperous East Asia"
Dr. Hamre, Ambassador Foley, distinguished guests, ladies and gentlemen. 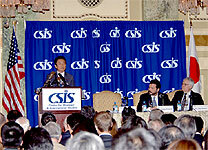 I am pleased to have this opportunity today to speak to you at the Center for Strategic and International Studies. As you might know, one of the founders of CSIS, Admiral Arleigh Burke, has a special relationship with Japan, dating back more than 50 years. was a sailor who gallantly and ably fought the Imperial Japanese Navy in the Solomon Seas and elsewhere in the Pacific. Less known is the fact that in 1950, Admiral Burke and my grandfather, Prime Minister Shigeru Yoshida, worked together to send Japanese mine sweepers to the waters surrounding the Korean Peninsula to dispose of mines North Korea had laid and to secure the path for the landing American forces. This was the first post-war defense cooperation between Japan and the United States of America. Admiral Burke praised the "job well done" by the Japanese mine sweepers and later actively assisted Japan in reestablishing the post war Japanese navy, the Maritime Self-Defense Force. This was the beginning of the 50 plus year old alliance between Japan and the United States. Today, I would like to talk about East Asia. I shall begin by reflecting on history. Throughout the history of mankind, there have been periods of relative calm as well as periods of dynamic changes. Great changes occurred typically when a new nation or a people suddenly burst onto the world stage and rose to influence other countries. The birth and expansion of great empires, such as those of Alexander the Great, the Saracens, the Mongolians and Napoleon, are examples of these monumental transformation. The rise of new powers has brought about new dynamism to human activities, such as trade, art, science and technology. At the same time, however, the rapid ascendance and expansion of new powers has sometimes led to instability and turmoil. Since ancient times, the sudden rise of a new power also often engendered suspicion and fear among neighboring countries and powers. We have seen the same pattern of history also in East Asia. It is in this historical context that I would like to share with you my thoughts about the future of East Asia. And that historical context certainly includes how we, the Japanese, view our own past. We are keenly aware that a rapid rise of the industrial and military might of the Japanese Empire since the late 19th century eventually caused great tragedy in the region affecting lives of millions of people. 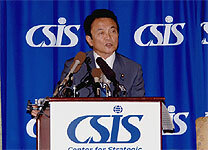 Prime Minister Koizumi, at the summit meeting of Asian and African leaders in Jakarta, Indonesia in April, 2005, and also at the 60th anniversary of the end of WWII in August, 2005, stated that "Japan caused tremendous damage and suffering to the people of many countries, particularly to those of Asian nations." He expressed "feelings of deep remorse and heartfelt apology" for this pain and suffering. My vision for the future of East Asia is rooted in this deep sense of remorse and apology which reflects Japan's strong desire and resolve to better contribute to the peace, stability and prosperity of this region. 1. The Situation in East Asia - "Opportunities and Challenges"
East Asia has been witnessing dramatic economic and political advancements over the past 25 years. And now, fresh winds of freedom, democracy and market economy are blowing across this region. East Asia, characterized by almost universal poverty 50 years ago, today contains many of the world's most vibrant economies. Since the end of WWII, Japan has played the role of "thought leader" in the region, imparting to other Asian countries the experiences and benefits of democracy and the market economy. The Asian economic miracle creates a large middle class, which in turn fuels expectations for greater freedoms and democratic institutions. From South Korea to Thailand to Indonesia to Mongolia, far-sighted leaders realized that giving their citizens the freedom to choose-at the ballot box and in the marketplace- is the best way to ensure a brighter future for their nations. I am confident that this trend is irreversible and as other countries continue down this path, the combination of economic development and political freedom will create even more "opportunities" for the region to expand its prosperity and stability. Of course, we must not let ourselves become complacent about the many challenges that East Asia still faces. The Cold War may have ended with the fall of the Berlin wall in 1989, but remnants of that period persist at the other end of the Eurasian Continent, most notably on the Korean Peninsula. Equally worrisome are newer threats such as terrorism, rising nationalism, and the growing development gap within and among countries in the region. There is a real risk that these negative factors could overshadow the region's enormous potential, or could even lead to instability in the region. Given the central role East Asia has come to play in driving the global economy, what happens in the region over the coming years will have profound implications for the future course of human history. The nature of China's rise, of course, is a key part of this equation. China's recent economic growth has been the marvel of the modern world. The Chinese economy now ranks fourth in the world-indeed it is larger than four of the G7 economies. Japan has been among the countries that have benefited most from China's economic dynamism. The eight-fold increase in Japan-China trade between 1991 and 2005 has been critical to reinvigorating Japan's economy, which had suffered from a long-term recession since 1991. Yet, one should not overlook the fact that China faces bottlenecks, such as the growing gap between both the rich and the poor and among different regions, as well as problems of environment, energy and water, which cast uncertainty over the prospects for dynamic economic growth in the future. Many observers are keenly watching if the Chinese economy can make a soft landing and achieve sustainable growth rates in the decades to come. Another concern for Japan, the United States and others, is China's growing defense budget. There has been a double-digit growth in China's defense spending for the past 18 years. In order to build confidence among its partners, it is important for China to increase its military transparency. China's transformation into a truly democratic nation will also become an unavoidable path in the future. Let me turn now to our future vision of East Asia and outline our strategy. Our goal in the region is clear: we seek to create "stable and prosperous East Asia." This can only be achieved by cooperation among all of our partners who have stakes in the region's future, and the Japan-U.S. Alliance will continue to play an irreplaceable role therein. Central to this process, we view a China that acts as an "opportunity" to its partners and a "responsible stakeholder" on the world stage as well as in the region as essential to East Asia's peace, stability and prosperity. As I mentioned earlier, there are those uncertainties related to China's development that must be resolved so as to increase the predictability of the East Asian regional environment. This predictability, in turn, is the key to achieving the ultimate goal of a "stable and prosperous East Asia." I believe China recognizes its own responsibility to strengthen the international system, since this system has enabled its own success. As you can see from the Six-Party Talks, for example, China has endeavored to help resolve issues that could impact negatively on itself and the broader region. Japan welcomes this sort of constructive Chinese engagement in the region. In order to further encourage such positive Chinese efforts, it is crucial that Japan and the United States continue to assist China's development through cooperation in mutually beneficial ways in areas like the environment, energy and water-those potential bottlenecks for China's future stable development. This is important, because such efforts will not just resolve some uncertainties of China's development, but will make China itself realize that this kind of constructive cooperation with other partners will serve its own interests. As a second and related step, we need to create a multilateral regional framework through which China can realize that its interests are best served by acting as a constructive partner and by interacting with its neighbors on an equal footing. Japan is determined, together with all partners in the region, to create a future East Asian order that is not closed but open to the outside, directed toward common interests, not individual ones, and founded on shared values, not on confrontational values. In other words, this region shall not become a theater of power politics driven by mutual suspicion and intolerant nationalism. First, promote freedom, democracy, market economy, the rule of law, and respect for human dignity. Recent history has proven that these are universal values that every human being deserves to share, regardless of their cultural, national, or religious background. And, recent experience in the region also tells us that developments of these values are intertwined, as economic development, which creates a stable middle class, serves as a vehicle for greater political representation. So, it is critical that this process is promoted in a well-coordinated manner. Second, fight against narrow-minded nationalism. The rising tide of nationalism in East Asia cannot be easily reversed, but it can be channeled in a positive way. That is to say, there is a fine line between a healthy love of country-which is called "patriotism"-and narrow-minded "nationalism" that breeds hatred of others. The third objective is to increase transparency and trust, and thus predictability in the fields of economic, political and military affairs in Asia. Transparency in the economic realm will prevent corruption and ensure fair competition. Transparency about intentions and capabilities in the political and military realms should greatly reduce the risks of a regional arms race or potentially catastrophic miscalculation. First, strengthening the Japan-U.S. Alliance in order to maintain the deterrent capability of the U.S. military, which has always been the cornerstone for East Asia's post-war peace and prosperity. Second, deepening cooperation with China in those areas where Japan and China share common interests and can both benefit, as I mentioned earlier. Third, promoting regional cooperation, in ways that allow us to openly interact and share benefits with external partners, and can encompass all essential partners with a future goal of building an East Asian community. Fourth, enhancing Japan's strategic relations with India-the largest democracy of the world, and Australia and New Zealand-long time friends in the region for both of us-while reinvigorating our long-standing ties with ASEAN. Fifth, working to address problems related to North Korea-a remnant from the Cold War-including nuclear and abduction issues. Last week, President Bush warmly received family member of Megumi Yokota, a Japanese girl who was abducted by North Korea in 1977 at the age of 13 on her way home from local junior high school on the coast of Japan Sea. President Bush's commitment to stand side-by-side with Japan to tackle the abduction issue gave enormous encouragement to the Japanese people and sent a strong and clear message to North Korea about our unified resolve. I would like to express my deep gratitude and respect to President Bush, the U.S. government and the U.S. Congress for their consistent support on the abduction issue. I would also like to emphasize the importance of the role to be played by the Republic of Korea, which is now one of the world's most vibrant democracies and an indispensable ally of the U.S., in our concerted efforts to address the issues of common concern - such as the abduction issue - and to realize eternal peace and stability in the Korean Peninsula, free of nuclear weapons. Let me stress once again the importance of Japan-U.S. collaboration in advancing our objectives in the region. At the core of this alliance is our shared embrace of the universal values of freedom, democracy, and free markets. We are committed to spreading these values across the region as a way to ensure that the stability East Asia has enjoyed for the past five decades will continue over the next 50 years and beyond. East Asia has a bright future I believe and I am confident that the whole region will eventually enjoy peace, stability and prosperity based on an open, free and democratic system of government, trade and investment. However, there is no guarantee that the path to that future will be without hardships. Rather, we may face a long and bumpy road ahead. As I stated at the beginning, throughout the history of mankind, sudden rise of a new power has created both promises and tensions. China's recent development, because of its unprecedented speed, seems to have also created both. A shining face of new prosperity and affluence in today's China is not without risks and potential problems. The same is true with East Asia as a whole. But these risks and challenges will be manageable only if the nations and peoples of East Asia work together for a better future, and only if they are wise enough collectively not to repeat the errors of the past. I have always believed Asians to be optimists. No doubt countries in East Asia are willing to work toward a common goal, because it is in their best interests to do so. Look at Vietnam. A country that fought a war against the United States has decided to host the next APEC meeting this year. Here lies a clear example of positive change in East Asia. Japan together with the United States wholeheartedly welcomes Vietnam's decision. Indeed, we have reasons to be optimistic in East Asia. Chinese leaders have succeeded in assuring that none of its more than one billion people suffers from hunger. This is one of the greatest achievements of mankind in the 20th century. Look also at the booming economy in the coastal area of China today, beaming with IT and other high tech industries. India, once among the least developed third world countries not so long ago, is now a giant in IT technologies, bringing new prosperity at home as well as sending thousands of IT engineers to the silicon valleys and other similar centers of information technology across the sea. Yet, people in East Asia will not stop their strides merely with newly found affluence. As it is stated in the Bible, "Man shall not live by bread alone." People in East Asia are now seeking and gaining something more than just material wellbeing. Perhaps, we can call it freedom to dream. A poor farmer's boy from the countryside in Thailand can now dream of becoming the world's best heart surgeon. A girl in a fishing village in the southern coastal area of India can dream of someday conducting the New York Philharmonic. Of course, we still see poverty, disease and other miseries in East Asia. But there seems no longer to be despair. Why is this so? It is because these boys and girls are now given tangible opportunities to achieve their respective goals and dreams within their own lifetime. Indeed, this is the path that Japan embarked upon in the post-war era ahead of others in East Asia. Devastated by long years of war, the Japanese people, including my grandfather, resolved that Japan would never again embark on military aggression. Instead the Japanese people advanced a consistent policy of peace and happiness through economic prosperity and democracy. This policy has served well the aspirations of the post-war Japanese people. They have achieved prosperity and a lot more. Many dreams came true. This policy should also serve the aspirations of people in East Asia providing them with opportunities to achieve their respective individual goals. They should share freedom to dream, to dream of a better future. So in conclusion, I shall repeat and reconfirm that Japan, based on the lessons of the past, will never deviate from its firm resolve 60 years ago to work toward peace, stability and prosperity in East Asia. We shall work, together with our friends and neighbors in this region, for an open and empowered East Asia conducive to the achievement of their goals and dreams. We shall be partners in this endeavor, not adversaries. For this purpose, we shall build a system of close cooperation and communication based on mutual trust and understanding, shared interests, fundamental values and experiences. The work has just begun. Naturally, there will be challenges and hardships, but the work will be done. And the work will be enjoyable because we will all be aspiring for the same goal. Everybody has a role to play in this endeavor and, as the poet Robert Frost wrote in one of his poems, "you come too."